Citizen science projects consists of volunteer ordinary citizens of any country, play a critical role in advancing the knowledge of distribution of wildlife. In the case of South Africa, these projects range from reptiles, butterflies, frogs and bird atlas (SABAP) projects and more. During the timespan of these projects the range of little known species expands; and sometimes new species or species that are thought to be extinct are rediscovered. The outputs of these projects informs land management decisions. One of the most widely-used citizen science projects by people undertaking impact assessments is the bird atlas project (SABAP2). As the records are collected by volunteers with their own resources, records can be biased in that they are close to urban areas or popular tourist places. As a result, our knowledge of wildlife distribution tend to be more accurate for habitats closer to suburbs compared to remote rural areas, and impact assessments in remote areas are based on short term scientific studies with very scant data. One such place is Limpopo province, where biodiversity knowledge is perhaps limited, but the area is targeted for increasing conversion of natural vegetation to different forms of agriculture and mining developments. 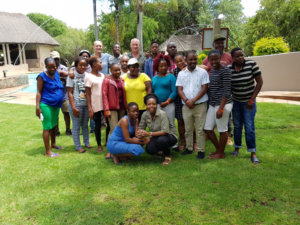 Recently, scientists from SANBI received funding from National Research Foundation’s (NRF) Foundational Biodiversity Information Programme (FBIP) to train selected youths from Mopani and Sekhukhune districts to contribute data to the bird atlas project (SABAP2). This area was chosen because it coincides with rich biodiversity and yet has sparse SABAP2 data. Secondly, there is increasing conversion of natural vegetation to different forms of agriculture. Lastly there are new mining developments in the area with a potential for further land transformation. The wildlife knowledge of a rural African child exceeds that of their peers who grow up in the suburbs, as they become familiar with their natural environment while herding animals or when going to draw water or gather wood. The challenge with this knowledge however, is that some species can appear similar but are actually scientifically completely different. These similar-looking species are often given similar indigenous names! In this project, the each young person trained was sponsored with two best national bird field guides, a pair of binoculars and a smart phone installed with the Birdlasser app. The latter intended to capitalize on familiarity of young people with phone gadgets and built-in applications and games, as the app is sure to make atlasing popular and fun. 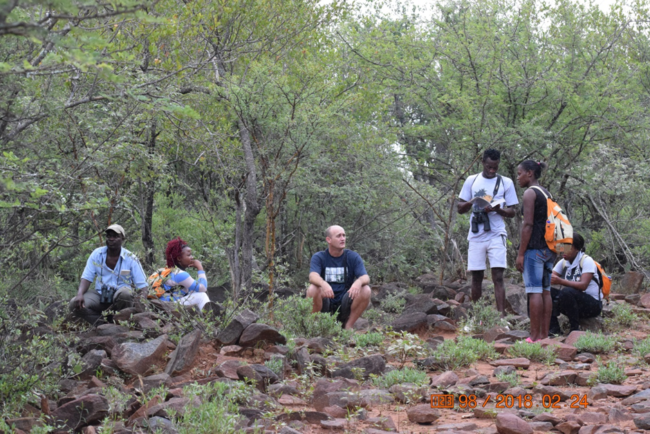 Thanks to co-funding from the Department of Rural Development and Land Reform, the participants recently completed two intensive separate training workshops, supported by local renowned bird guides, Birdlasser representative, BirdLife South Africa representative in Limpopo, and SANBI scientists. In the initial phase, the youths contributed data to SABAP2 under the guidance of the said bird guides. They have now begun contributing data on to SABAP2 on their own, on the weekly basis, and are given a monthly subsistence allowance based on time spent recording birds. While some of the participants have challenges of internet connectivity, the project is proving to be a great success as the area where they live is beginning to change from yellow to purple on the SABAP2 website, indicating intensive atlassing coverage since the project started. Besides the value of citizen science data to inform land management issues, these data are increasingly used by academics to predict response of species adaptation and impact from climate change. The youths in the current project are gaining valuable experience in bird identification and atlasing, which may provide opportunities for employment as bird guides in the ever-growing tourism sector. For more information on the project contact: David Maphisa and Theresa Sethusa.